Not intended for use by persons under 18. Do not use this product if you are nursing, pregnant or attempting to become pregnant. Consult a medical doctor before starting any diet or exercise program. Consult a physician if you have any pre-existing medical conditions or if you are using any prescription or over the counter medication. Discontinue use and consult your health care professional if you experience any adverse health effects from this product. This product may contain ingredients banned by certain sports organizations. User accepts all risks, liabilities, and consequences in regard to testing. Use only as directed. Do not exceed recommended serving under any circumstances. Do not us if packaging has been tapered with. Store in a cool dry place. KEEP OUT OF REACH OF CHILDREN. 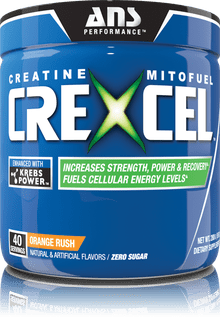 CreXcel is a one-of-a-kind creatine supplement that combines creatine monohydrate with a handful of carefully selected, highly potent natural ingredients. Through this cutting edge formulation, ANS Performance's CreXcel promises to deliver results unparalleled by any other creatine product. The main components of ANS Performance's CreXcel are creatine monohydrate, shilajit and CoQ10, plus a combination of vitamins and minerals. These ingredients have never before been mixed together, but they all have one major thing in common: cell energy. This is going to take creatine's effects to the next level. 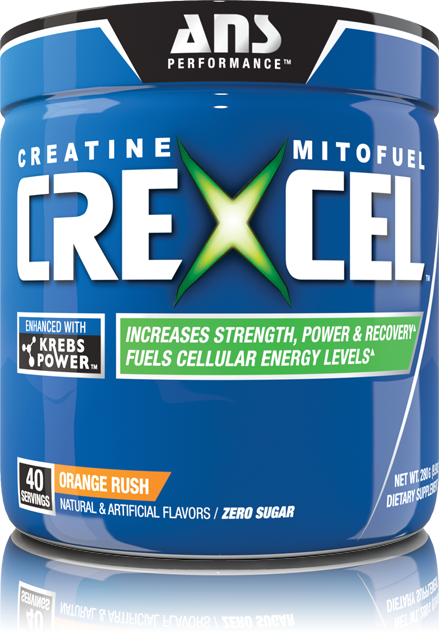 Arguably the most popular form of creatine on the market, creatine monohydrate is the foundation of CreXcel. ANS Performance has included it at an appropriate 5g per serving. Creatine is popular for its performance-enhancing effects. Once digested, it gets converted into creatine phosphate, which is soon stored in muscle tissue. During exercise, the phosphocreatine stored within muscle is converted into ATP, a major source of energy produced by the human body. Vitamin B3 plays a key role in the body's ability to convert food to fuel. It also supports the nervous system, liver, eyes, skin, hair, and proper circulation. The human body requires calcium for a number of functions, including muscle health, nerve transmission, vascular contraction and vasodilation, intracellular signaling and hormonal secretion. Magnesium is a mineral that is required for energy production, protein synthesis, muscle and nerve function, and blood pressure regulation. 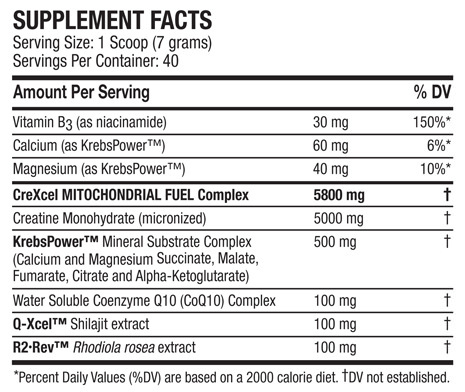 According to ANS Performance, this unique combination of ingredients will provide results incomparable to any other creatine supplement. 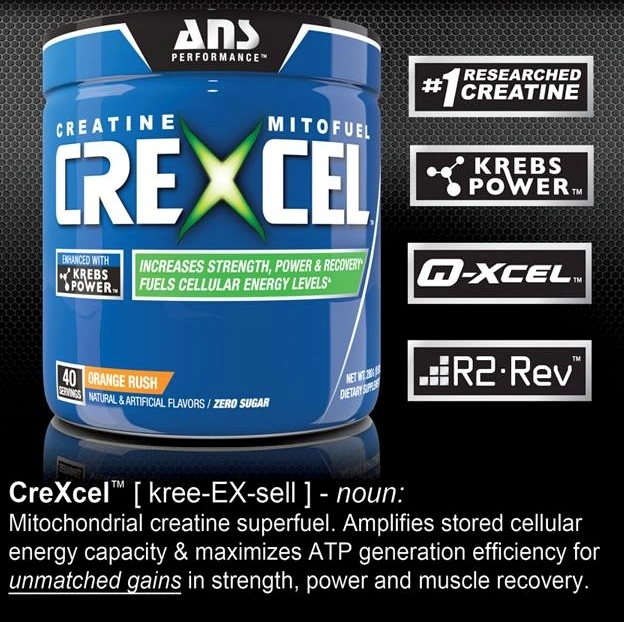 CreXcel is formulated to promote ATP production and utilization, and "improve the body's ability to generate energy naturally," according to the company's website. The majority of ingredients used in CreXcel are recognized as safe, causing little or no side effects. However there are a few components that could potentially have detrimental effects. Using the product as instructed will minimize your chances of having problems. Creatine has proven to be extremely safe over the long-term, and concerns over its use have been alleviated long ago. [12,13] Vitamin B3, also known as niacin, may cause a side effect known as the "niacin flush" — a burning or tingling sensation, often paired with reddened skin. Heightened levels of calcium can potentially lead to poor kidney function, soft tissue and vascular calcification, constipation, and hypercalciuria (heightened levels of calcium in the urine, which can lead to kidney stones). There is also evidence suggesting that high calcium intake may interfere with the absorption of zinc and iron. Large doses of magnesium can result in digestive issues, such as diarrhea, nausea, and abdominal cramping. At toxic levels, more serious side effects can occur. The key is to read your product's label and take only the recommended dose for your weight and gender. Talking to your healthcare provider before adding any new method of supplementation to your regimen will great reduce any chances of experience negative or dangerous side effects. At PricePlow, our mission is to make sure you get the most for your money. We offer you a platform to compare prices, ensuring that you get the best deal on all your nutritional and fitness supplements. Be sure to take a look at our unbiased reviews and browse our thoroughly researched supplement guides.